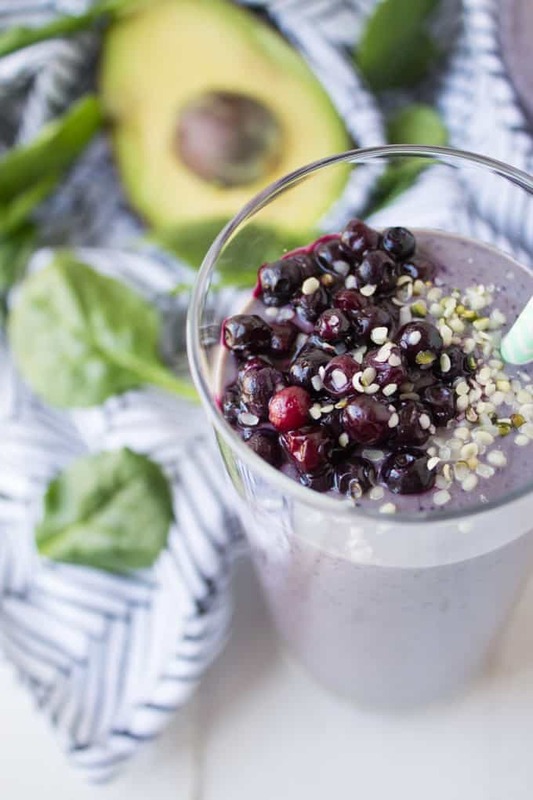 This vegan energy boosting smoothie is packed with nutrients and antioxidants that will give you long-lasting fuel to naturally carry you throughout your day. Sometimes I like to play this little game with myself called how many ingredients can I cram into one smoothie without breaking my blender. This round I thankfully won. Kara: 1 Blender: 0. I wanted to create a smoothie that was antioxidant packed but also would fuel me with natural, long-lasting energy. 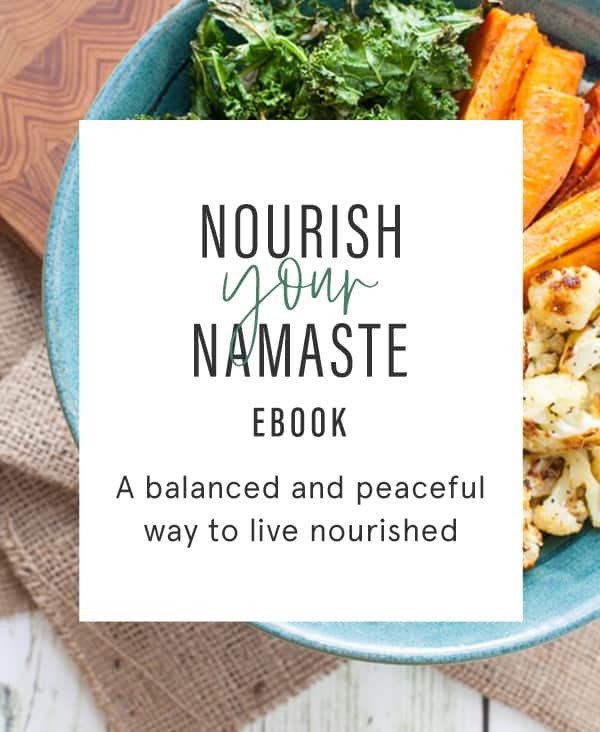 I have a whole chapter dedicated to energy in my upcoming e-book, Nourish Your Namaste: How Nutrition and Yoga Can Support Digestion, Immunity, Energy and Relaxation, because we’re currently in an energy crisis. Everywhere I look people are EXHAUSTED, downing shots of espresso and gulping cans of Red Bull, just to make it through the day. This exhaustion probably has something (or everything!) to do with the fact that anytime I ask someone how they are, they’re default answer is “I’m so busy.” I’m guilty of this default answer myself. But it’s true. We all feel really busy. Because we’re working longer hours than ever before, working more days than ever before and work and home life has never been more blurred with the use of smart phones to connect us 24/7. This is why it’s crucial to make sure that despite feeling busy, we make time to nourish our bodies with energizing foods that will fuel us through our jam-packed days. Otherwise, we’ll crash and get hangry and reach for a quick-fix of caffeine. But caffeine only lasts for a short period of time, until we crash and crash hard. Wouldn’t it feel so much nicer to have a natural dose of energy throughout the day rather than these highs and lows? The foods that provide us with the most energy are the ones that have a balance of all three essential nutrients – protein, (complex) carbohydrates and fat. Because we need all three nutrients to make our bodies run efficiently. Otherwise, we’ll just putter out, like a car with no fuel in the tank. 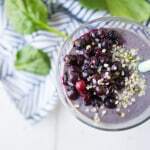 The ingredients in this smoothie are a good source of all three nutrients and some are a good source of iron, which has been shown to impact energy levels. Other ingredients are hydrating, containing a good amount of water content and dehydration has also been shown to cause fatigue. 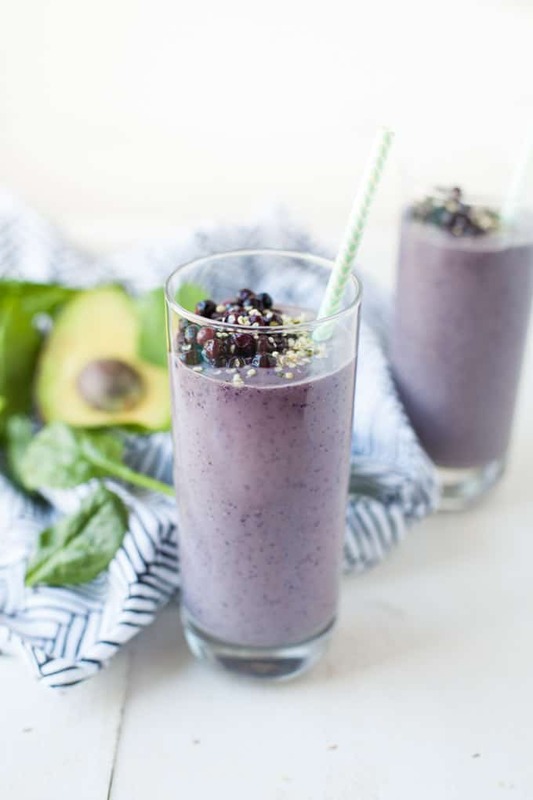 This smoothie is totally creamy and luscious too, thanks to the avocado and silken tofu. 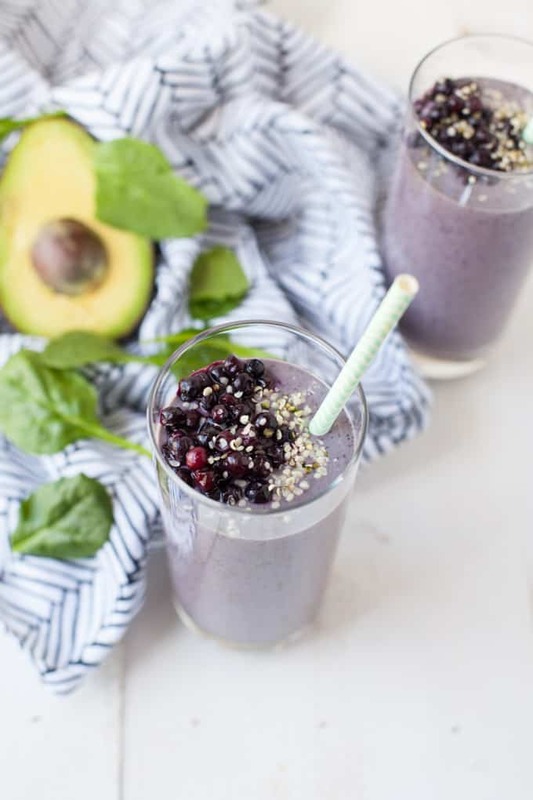 Sip on this smoothie in the morning to jumpstart your day or mid-afternoon to combat the afternoon slump and trip to the coffee pot. 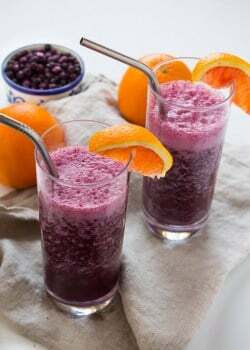 This recipe was created in partnership with Wild Blueberries Association of North America. However, I was not compensated for this blog post and as always, all opinions are my own! Oh this looks so good! My kids LOVE blueberries..they would love this! Does anyone know if I could add a protein powder to this? I neglected to say that the 29.5 gm carb count is for 1/2 the recipe if blueberries are reduced to 1/2 cup. I’m not a dietitian and this is just an approximation. Hi Kara, This looks great. I was surprised to get to the end of the recipe and see that there was no nutrition information. I’m diabetic and have been vegan for 21 months. I still need to count carbs to keep my blood sugar under control. I had to sit with the Calorie King book and a magnifying glass to figure it out. I need to keep breakfast under 30 gm of carbs. The best I could figure is that if I cut the blueberries to half a cup, it would be 29.5 gm of carbs. I’m a retired RN and have known some wonderful dietitians at the hospital. They have masters degrees and RD after their names. They never call themselves nutritionists. 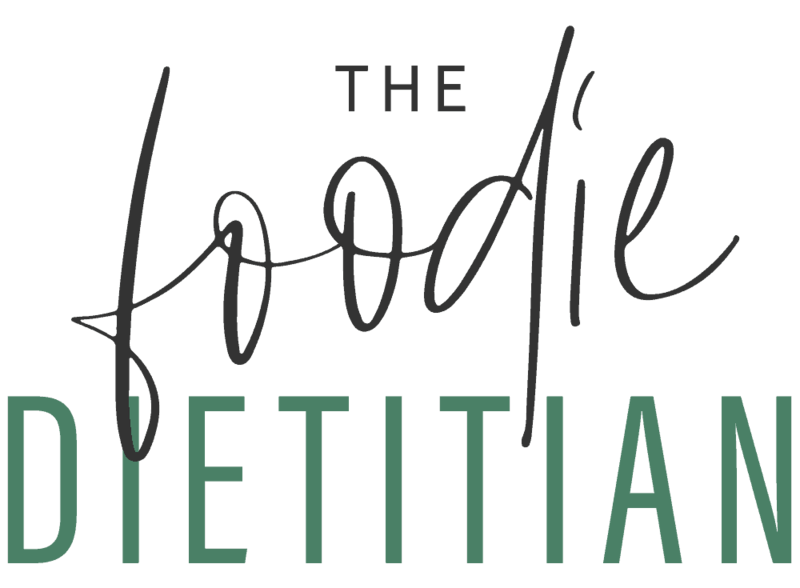 So, if you don’t have the credentials, I hope you’ll take the word dietitian out of your introduction. Dates & tofu & berries in a smoothie?! You’re speaking my language!! I need to get back to adding silken tofu to smoothies. It makes it so creamy! For sure! Love that creamy texture. Looks so good! I love all these ingredients but always forget about smoothies once the weather gets colder! 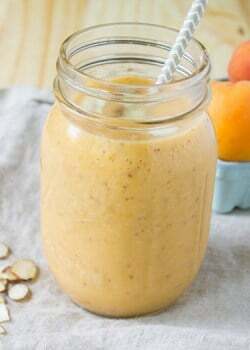 LOVE THIS SMOOTHIE. I was terrified, because of the tofu, but maaaan, it’s delicious! Yay! SO glad you enjoyed it, Donaven! I tried it and was blown away! Thank you for this recipe! Awesome! SO glad you loved it, Maria. Wow! 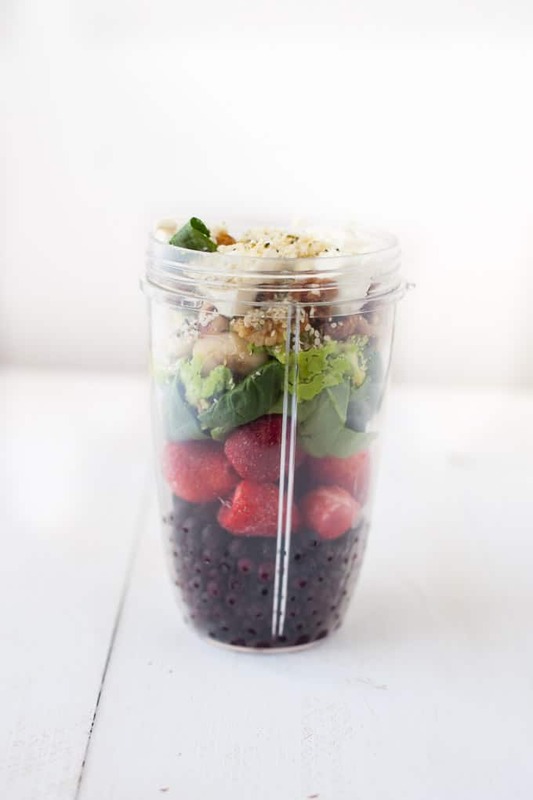 This is a nutrition-packed smoothie! Sounds delicious. Thanks! This is a go-recipe for me. Enjoy! I love that you added walnuts and hemp seeds 🙂 Sounds SO delicious and perfect for boosting energy. Yes! So important to have a healthy balance of protein, fat and carbs for optimal energy. Thanks, Sarah! Even the before picture is beautiful! 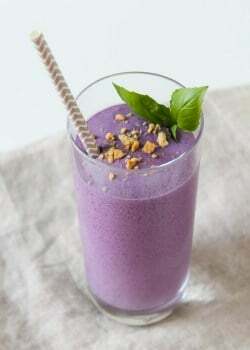 I love adding tofu to smoothies, great protein and texture. Looks amazing! 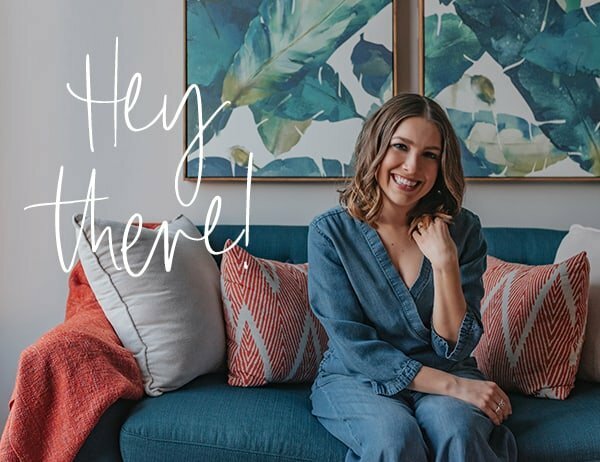 Congrats on your upcoming e-book – love the title! And wow, you did cram a lot of goodness in this smoothie. Love the color! Let me know when your e-book is out. I love the idea … especially your tips for getting more energy through good nutrition. 3. Thanks for introducing me to wild blueberries, they’re really so so so good! Way better for smoothies and life than the old boring regular frozen berries!